I am a bit late to the debate on the Key share ownership issue due to being red-carded for awhile. However, I have been studying the issue and find it hard to see where any conflict of interest issue arises. Every company must maintain its’ own share register recording details of shares issued and shareholders. The Companies Register is not the share register for the company. If you have any queries concerning the company’s share details recorded below, you need to contact the company. and in how regularly the company record is updated.’. But surely this will be the case regardless of what structure the shares were transferred to. There will still be a record on the records of the original companies showing where the shares had moved from and who to. So, I don’t really see an issue here regardless of the blind trust structure. But the share transactions from the original companies to Whitechapel don’t show up on the Whitechapel side, if you check on the company office records. This is obviously because changes in share allocations within the original companies reflect changes in ownership of those companies, which the companies office is interested in. However, shares transferred to Whitechapel are effectively assets of that company, rather than part of the ownership structure of Whitechapel. Hence, the companies office is no more interested in shares that Whitechapel owns than it is interested in how much stock my company has on the shelf. Therefore it is impossible to tell from Whitechapel’s records anything about movement of shares that Whitechapel owns. I agree it is possible to know something about movement of the shares originally transferred by going back to the records of those original companies. But what if Whitechapel sells those original shares and buys shares in other companies? What is the mechanism for how those transactions can be traced given there is know way of knowing from Whitechapels company office records which shares were purchased to replace the original shares that might have been sold? Perhaps I am missing something. If so, I am open to being shown wrong. However, I suspect this is where Labour’s argument may break down. I didn’t know that Labour was taking all of this seriously. They seem to have been curiously quiet on the issue apart from a few quips and maybe a few muted press releases (although I haven’t seen those – people haven’t been linking to them). I was under the impression that questions on the shareholding was largely being driven by the media and the people on the blogs? What is interesting is the potential for undeclared conflicts of interest in making policy. That is why we require parliamentarians to declare their interests. John Key appears to avoided that declaration by putting his interests into a ‘blind’ trust. However he also appears to know what is in that trust. It means that he is effectively avoiding the oversight of the public looking for conflicts of interest. I don’t know about any conspiracy theories. However, the allegation that Labour has been making is that Whitechapel mirrors what is going on with Keys investments. What I have shown is that there is no way Whitechapel can mirror anything. Keys lawyers have stated in their letter that they aren’t telling him anything about what is going on. If we take that at face value, then Key has no real way to track his investments. Of course he can do what the Justice department suggests and go back to the original companies to view their share record. However, it seems to me this will just tell him what he could know regardless what entity the shares had been transferred to and nothing more. After all, he obviously knew he had disposed of his interest in the shares, so he would expect the records of the original companies to show that. So the records of those companies would merely confirm what he had known to have happened. So far as Whitechapel is concerned, it seems to me it is as blind as it possibly can be. You don’t seem to greatly disagree with me on this. So I wonder why there has been so much fuss about it on this site. you’ve shown no such thing. All Whitechapel’s transactions can be found on the companies website. And we know that Whitechapel was set up when Aldgate was and has only ever owned the shares that Key sold into it. My conspiracy theory is…Bronagh Key is a trustee and knows exactly what the score is, where the money is, and that it would be ludicrous to assume she doesnt tell her husband exactly what the deal is on what they own. Its the lying that trips Key up. He’s just so crap at it and the more cries of ‘i know nothing’ the worse he looks. So yeah whats the Dairy investment stuff he’s into ? Where does that money trail lead is what we’d all like to know. He said he “couldn’t” know what was in his blind trust. Not that he “didn’t”, but that he “could not”, as in, was unable to. I would suggest that having his wife as a trustee of the trust would be so mind-numbingly stupid that even sideshow wouldn’t do that. Didn’t English have his wife as trustee in a family trust he ‘supposedly’ had no pecuniary interest in while he rorted the MP accom benefit ? so is Key’s trust also a family one ? and in terms of mindnumbingness, i’d draw for a par between Key and English. I should clarify what I mean by my last comment. I am not holding you responsible for the views of others on this site. However, it seems to me that you are an intelligent person and you were able to grasp very quickly what I was pointing out in a matter that is quite simple when it is analysed.. So I am wondering why others posting articles haven’t done a bit of simple analysis before firing off with what appears to be half-baked theories (as the Labour party also appears to have done). yes they do. search by sheareholder and enter Whitechapel. by searching the transaction records of the individual companies that Whitechapel owns. Each share transaction is recorded. You need to actually take a look at the companies register website before thinking you’ve got it right and everyone else has it wrong. However, not completely wrong. There is still my point about the companies office disclaiming that it is the same as the shareholder record of the company (which is what Labour has been effectively claiming). Also, there is the other point I made that companies are only required to update their records annually (probably the reason for the companies office disclaimer). So, someone like Key would be making a huge leap of faith in basing decisions on records he could see on the companies office site as things could have changed considerably since the last update. As the companies office statement points out, the only reliable way to know these sorts of details is to go back to the company itself and ask. However, according to the lawyers letter that Key provided, they wouldn’t tell him anything. So, I still think that Labour has got problems on this one. I’m quite happy to use my real identity now as I don’t intend to say anything I can be sued for. Care to follow suit? [lprent: Generally I’d prefer if people don’t use their real identities. In my opinion, pseudonyms allow for a freer debate. The moderators and I are perfectly happy to ensure that whatever you say is moderated where required. We do this to ensure that the debate keeps flowing, to keep within the standard of behaviour required on this site, and to protect ourselves from being associated with repugnant behaviours. There are two cases when identity is important. The first is where you are asserting something that requires your IRL skills for support. That usually happens because you can’t link to information relating to that point – which is suspicious for anyone that does know their field. The second is where you’re running a site like this which is standalone and requires a domain name. Then there must be at least one point of contact. Follow suit and use your real identity? I don’t think you’d like that. Just a word of friendly advice, felix. Let’s have a big hand for Tarquin, the little guy with the big brain and all the names, he’ll be here all week, don’t forget to tip your waitress and drive home safely. Totally opposite to Russell Browns blog. He prefers banning people under their real names and giving others a free pass under pseudonyms. The worst being that toxic old fruitbat [deleted] posting as Islander. I’d throw in a 3rd: where well-known people throw in their two cents on a comment thread. Eg David Farrar, David Cunliffe or Trevor Mallard. How is it possible to deport someone from a country when they entered that country while in custody, and they never intended to enter that country in the first place? It may just be the words that are being used by reporters, but it seems a bit odd. Yes, the subtle misuse of words happens all the time in the MSM. On RNZ this morning we were told that Australia was taking Japan to the world court over its whale cull in the southern ocean. Here, the word “cull” quietly infers there is an over-population of whales and that killing them is a resource management issue. A more objective word would have been “catch” (although the Japanese whalers might object ). I suppose the whalers would prefer we called it a “sample”. Chomsky is the one who brought me to anarchism, but sadly Chomsky is one of the weakest anarchists out there. Time and again the argument has been put to Chomsky, often citing his own work which has ample evidence, that these private tyrannies are only sustainable with the power of the state backing them and Chomsky has never responded coherently to these charges. See for an example Chomsky’s Augustinian Anarchism. This is where we disagree. I’m with Chomsky on this (and with DavidE – comment No. 7 on your link). This is how I see it (I can’t speak directly for Chomsky). States were created BY ‘private tyrranies’, not the other way around. Similarly, actually existing markets have been and are being created by ‘private tyrranies’. So, private tyrranies are the fundamental problem (not the state). Private tyrranies are not ‘sustained by the state’ because they pre-existed it. Private tyrranies will sustain themselves by whatever means it takes to sustain them at a particular point in time – and there’s been plenty throughout history. Abstractly, private tyrranies gain their advantage and power by co-opting, by some means, a disproportionate share of collectively produced wealth. That, then, allows them to opt out of collective social processes (ultimately to the point where whole swathes of the membership of the collective come to be seen as inferior beings, perhaps not even human). When did private tyrranies begin? Probably around the same time as the advent of agrarianism. In ancient Sumer, for example, we see the development of the first ‘modern’ hierarchical society. A priestly class forms and can be sustained by co-opting – via religious discourse in this case – part of the collective wealth as surplus grain that could be traded to support this unproductive yet high-status class. In fact, a good case could be made that storable and defendable surpluses are probably the beginnings of – or at least are fertile ground for – the development of private tyrranies. The only non-tyrranous societies that reliably reproduced (and in a few cases still reproduce) themselves were hunter-gatherer societies (as I keep pointing out). It’s no coincidence that hunter-gathering, by definition, does not rely on extensive food production and storage. Instead it relies upon individuals pooling their collective efforts and wisdom and, in turn, a collective that values what each member can bring to that effort. You therefore end up with a flat society with virtually no inequality. I’m willing to bet that the kind of freedom that ‘works’ for people – practically, emotionally, individually and socially – is the kind that this form of life brings with it. And … not a market to be seen. I imagine that Chomsky, like me, does not think that the way to dismantle the state and, more importantly, reduce oppression in society, is to expand market relations. Rather it is to expand and deepen social relations. That is, non-market relations need to be expanded in order to undermine the monopoly on coercion possessed by the state. In that way, too, we have our best chance of enjoying the real, human freedom our long-distant ancestors simply presumed as part of their existence. By private tyrannies I take Chomsky to mean big corporations as that’s how he always refers to them. My argument maybe narrower than you were thinking. When did private tyrranies begin? Probably around the same time as the advent of agrarianism. In ancient Sumer, for example, we see the development of the first â€˜modern’ hierarchical society. A priestly class forms and can be sustained by co-opting via religious discourse in this case part of the collective wealth as surplus grain that could be traded to support this unproductive yet high-status class. In fact, a good case could be made that storable and defendable surpluses are probably the beginnings of or at least are fertile ground for the development of private tyrranies. This is simply not true. See this video for an example The Unnecessary State (Rise of Civilization) Neither are all hunter-gatherer societies non-hierarchical and equalitarian. I’m sorry but all this to me smacks of primitivist anti-civ nonsense. It’s not about expanding market relations it is about freeing the market. Removing the regulations, subsidies and legal privileges that have created the oligopolistic market-place that we have. I agree about expanding and deepening social relations, but what has that to do with expanding that state as a bulwark against private tyrannies? The state is violent, coercive and hierarchical it is anti-social. This is about a critique of Chomsky’s strategy. Not a theoretical dispute about anarchist preferences or misplaced antediluvian nostalgia. I’m more in agreement with Puddlegum. Reducing regulation and the state’s effectiveness it not the answer. The state needs to be utilised to better serve its constituents, hence is required to partake in commerce. The key is to reform political structures to diminish the influence of the elite while improving overall accountability, performance, and transparency. Under the current system, major political decisions are made on our behalf. Too much political power is concentrated into the hands of the few, favouring dominance and the potential for abuse. This imbalance of power needs correcting if the people are to be better served. The current system is a poor representation of the public mandate being severed. The move to MMP shouldn’t be seen as the end of political reform. It increased political diversity and the public’s voice, but not in the most effective way. We can and must do better. Keeping the public at arms length from the major decisions that affects them will continually fail to see the decisions being made best serve them. Most would agree there are certain issues/policies within the party they last voted for that they don’t fully support. And I think most voters would appreciate an improved political structure where the people had far more say in the issues that affect them. 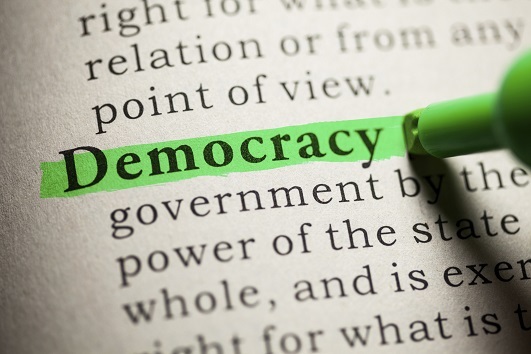 New Zealand First wants to form a practical partnership with the New Zealand people by the judicious use of direct public referenda (note: see more at NZ First website under policies). We need more parties to adopt a similar policy. By and large, politicians are no smarter than your average person. And by and large, politicians are not experts in the field they govern over. The people should be allowed more say in the issues that affect them. A form of direct democracy should be considered. I believe this is an issue of interest that will benefit all voters regardless of their political affiliations. Moreover, improving political structures is a healthy way for the nation to grow and develop as we move forward. Is Labour up for the challenge? Chomsky does refer to corporations as ‘private tyrranies’, you’re right. I assumed you were referring to corporations. My point, and the reason I used scare quotes around that term, was to point out that clearly Chomsky believes that corporations are just the latest manifestation of the broader tyrrany of private power and wealth. Perhaps oddly to your eyes, I see the state (certainly in its emergence) as simply a manifestation of the ongoing expression of private tyrrany. Chomsky’s book ‘year 501’ deliberately goes back to well before the invention of corporations to show the constant machinations of power. Similarly, you must be aware of Chomsky’s continual quoting of Adam Smith’s comments about the corrupt ‘rulers of the world’ (or words to that effect). Adam Smith’s comments, again, come well before the invention of corporations. I honestly can’t understand why you believe my comments on hunter gatherer societies represent ‘misplaced antediluvian nostalgia’. If they are then almost all of the anthropological, political, evolutionary psychological and evolutionary biological primary literature that deals with these matters must also be characterised in that way. (I’ve read quite a bit of it). I’m not familiar enough with the internet to be able to point to blogs or other websites that might act as an accurate echo chamber for the main thrust of such literature but a quick search for ‘hunter gatherer democracy’, or similar, in google scholar will quickly verify that researchers in these fields almost universally accept that hunter gatherer societies (especially the less complex forms assumed to epitomise the social form in human evolutionary history) were extraordinarily (by today’s standards) egalitarian (i.e., a flat social structure and very minimal differences in ‘wealth’ between members). It is true that some more complex forms that have partly adopted semi-horticultural practices have the beginnings of social differentiation and stratification – but that is rather my point.Even those who are wary of ‘noble savage’ arguments fully accept this egalitarianist characterisation of hunter gatherer societies if only because they accept the fact that such societies simply don’t dominate enough resources to allow for social stratification to occur. I think our differences stem partly from the fact that I’ve approached the study of human behaviour initially from a natural science perspective (particularly biological development, evolutionary biology, human physiology) and then added a behavioural social science perspective. That means I find standard classical liberal accounts of the ‘self’ and ‘individuals’ as remarkably anemic, disembodied and anti-empirical – yet it is those accounts which dominate discussions in political ideology, economics and philosophy. As for ‘removing the regulations, subsidies and legal privileges’ in relation to the market, a rule of thumb would be, for each regulation, to see who squeals at the suggestion that it be removed. sounds like some polynesian based anarcho-syndicalist system Pasifikans have been practising since day one or maybe what Whanau Ora aspires to. Only Brownlee and pals would be so inept and stupid to grin with glee at the off shore oil explorations announced yesterday with Petrobras; and his comment advising us not to worry as the oil companies will have better safety systems available by September or so … see this informative Rachel Maddow clip .. nothing has improved since a Gulf spill June 13 1979 and the bad news is that wells re simply deeper than ever … how do we stop this insanity in our pristine waters ? Good article on the contrast of oil disaster reactions comparing USA with the Niger Delta. How the taxman may keep many fishermen from getting compensation from BP: The fishermen and the tax man. What do you think; fact or junk science? Ummm I don’t know much about crude oil (and in particular the oil in the gulf of mexico). At a guess I’d say that it depends entirely on the composition of the oil. In particular the average molecular weight of the crude relative to that of the surrounding seawater and the relative freezing points. The latter is quite important as is shown with the very light methane freezing out in a complex mix with water ice that clogged up their first attempts at capping. But generally I’d suspect that thicker hydrocarbons don’t mix well with water. They are usually lighter in molecular weights than the surrounding water unless you’re heading up to the heavy oil / tar fractions. They are a mix of H (1) and C (12) atoms, compared to water H (1) and O (16). Seawater also has a high sodium and chlorine content in solution which would also push the seawater molecular weight up. But of course the effects of being at 150 atmospheres at a kilometre and a half down would make a hell of a difference. Not to mention that the oil is likely to be at a much higher ambient temperature as it comes out of from under the insulating rock (oil out of a field is usually warmer than seawater ambient at any significant depth). They are also gas propelled out of the wellhead. If this was Arabian gulf light crude, then it’d hitting the surface fast. If it was that sludge that they call heavy crude (from say Venezuela) , then I think that you could be right. I have no idea what grade they’re pumping in the gulf of Mexico. Burt – do some reading. A lot of the underwater plumes are thought to be the product of oil mixed with “dispersants”. Heaven knows what its chemical nature is like now. It’s not much use us amateurs speculating about it. It’s on open mike rO,. I want to hear what lprent thinks about them. A protest against the attack on the Aid Flotilla to the Gaza strip has been organised at short notice for Saturday in Wellington. 12.00 at the Bucket Fountain in Cuba Street, Further details are here.